Antonio Guterres is mulling the option of talking to senior official and will see how things can be improved on the ground. 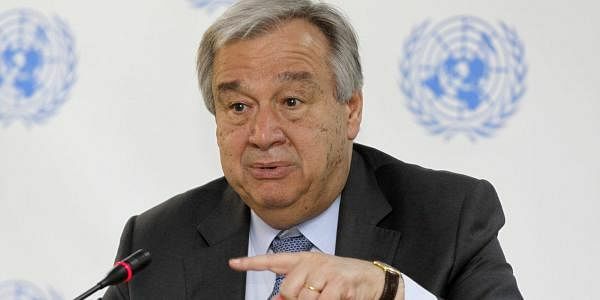 UNITED NATIONS: UN Secretary-General Antonio Guterres is mulling the option of talking to senior officials from India and Pakistan on the situation in Kashmir and will see how things can be improved on the ground, his spokesperson has said. Guterres "will talk to different officials if it helps (to) move the process along. That's something that he is looking into. Beyond that, I have nothing new to say about the issue," UN chief's Deputy Spokesman Farhan Haq told reporters here yesterday. Haq made the remarks when he was asked at his daily press briefing about the situation in Kashmir and if Guterres has been able to understand the Kashmir dispute and would he be talking to Prime Minister Narendra Modi to start a dialogue with Pakistan. When asked if there is a timeline as to when the UN chief will talk to leaders from the two countries, Haq said as with any number of long-running situations, there are "a lot of complex issues" that need to be examined. The UN Chief "will look into the issue, and certainly, he will try to see what can be done to improve the situation on the ground," Haq said. Former UN Secretary-General Ban Ki-moon had repeatedly expressed deep concern about the deteriorating situation along the Line of Control in Kashmir and called on all those involved to prioritise the restoration of calm and stability in order to prevent any further escalation of tensions and loss of lives. Ban had called for the two nations to resolve their difference bilaterally, saying that his good offices were available to India and Pakistan if "accepted by both sides".